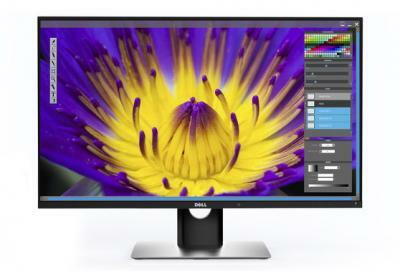 In early 2016 Dell announced the world's first OLED monitor, the 30" 4K Ultrasharp UP3017Q. This interesting and innovative monitor was supposed to be shipping in March 2016 for $4,999 - but that did not happen, and reports suggested that Dell canceled this monitor as the company was unhappy with the image quality of that OLED panel - especially the amount of color drift that it displayed when you viewed the monitor from the sides. But Dell now started shipping the UP3017Q, and the price is set at $3,499, or $1,500 lower than the original price Dell announced in 2016. Hopefully other companies will follow suit to release OLED monitors as well. The UP3017Q features a 4K resolution (3840x2160, 147 PPI), a refresh rate of 60Hz, viewing angle of 178 degrees (both vertical and horizontal) and a brightness of 300 cd/m2. The monitor supports mDP (1.2), HDMI (2) and USB type C.
Do we know if this is based on an LG panel or an SDC one? I've been looking around but can't find any info, not even whether it uses RGBW or RGB. If I had to guess it's an LG panel, just based on the assumption that it's easier to scale down in size (at least in this DPI range) than up, but it's only a guess. Too expensive... but great news! Originally, Samsung was reportedly the OLED-panel supplier for the monitor. But there is a probability that uncancelling the monitor became possible exactly by changing the supplier to LG. It is also possible that the monitor will be available in a very limited amount and is eventually “released” just to save reputation and make the monitor producer the formal pioneer and leader of the OLED-monitor market. In this case, Samsung can still be the OLED-panel supplier (it’s certainly possible to produce, say, 10 panels in total even if yield is very low). The monitor is now specified as “No longer available” on the Dell’s website.